One year later and an award! 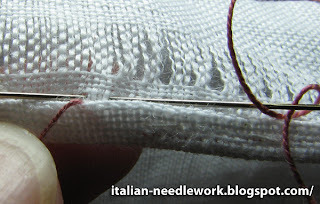 Something exciting for those of you who can't get to Italy to take a class in Reticello embroidery! 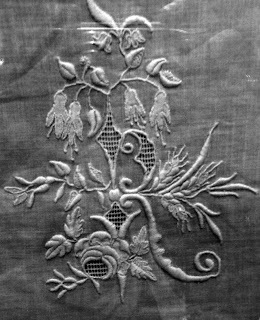 The Embroiderers' Guild of South Australia is holding cyber classes! You don't have to be a member of the Guild to participate, though of course costs are higher for non-members. 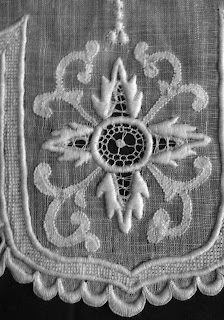 Costs, however are very low and the chance to study under embroidery master Christine P. Bishop is a treat in itself (click on her name to visit her website). 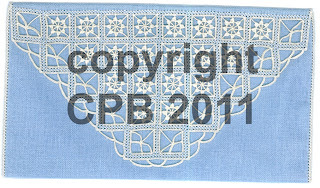 Right now you can sign up for a cyber class of an intricate cutwork purse with "reticella style fillings". 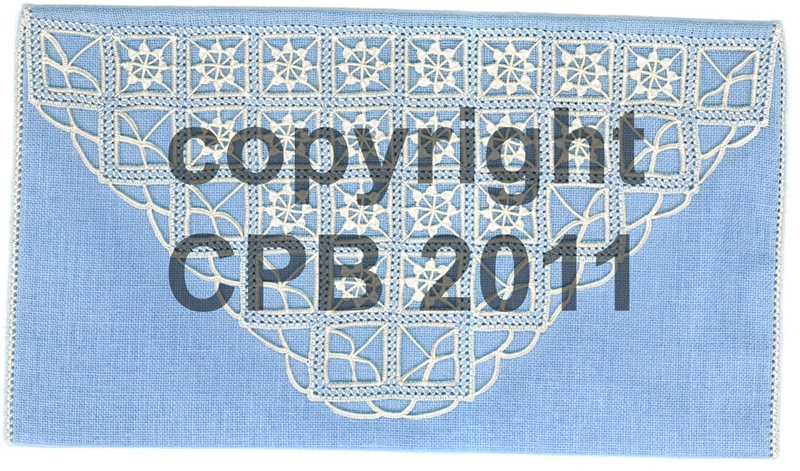 Cutwork purse with reticella style fillings by Christine P. Bishop. Sign up ends May 9th with course completion by June 13th. This cyber class is a 4 week class so the cost is $35.00 Australian dollars for non-members of the Guild and an additional $17 AUD for materials plus shipping. Take a look at all the pages under the Cyber Classes tab on the Embroiderer's Guild of South Australia website to fully understand how their cyber classes work. Christine tells me that due to her busy schedule of teaching, she may not be able to do another cyber class for some time so if you've been longing to study with her, wanting to try some Reticello, or been intimidated by non-English instructions, now is your chance! If you would like to learn more about Christine P. Bishop visit her website or Tuttoricamo (click on the British flag for the English pages then click on "Prominent Characters" then under the "Today" heading click on her name). Well here I am one year after starting this blog. 176 posts was all I could manage in a year. I had rather hoped to post everyday and it started out that way, but then I took on more and more projects... I just can't say no to interesting collaborations! However, I'm still here and I still hope for time to post more often. There are some 200+visitors a day which I find mind-boggling. I have heard from so many people! Some looking into research, others are people hoping to sell antique pieces of needlework, still others are people looking for appraisals! I never even thought about what I would do about receiving messages from people... it never occurred to me that anyone would write to me. Now I am often overwhelmed by the amount of email to be answered and have some messages still in my inbox from last August! I recently received an award from a fantastic blogger named Racaire who lives in Vienna. You can read her blog here. I received the same award from Eva in Finland, you can read her blog here. The requirements of receipt of this award as I understand them is to answer the following questions and then nominate five other blogs. 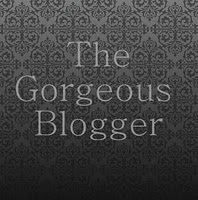 I have to say that blogging myself has made me much more aware of other bloggers and it is difficult to choose only five gorgeous blogs but I will list my choices at the end of this post, they of course follow my interests! I started this (my one and only blog) on March 21, 2010. 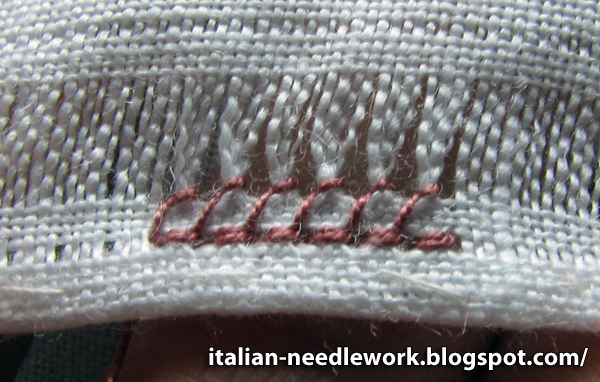 I write about Italian needlework and pretty much anything Italian textile related. 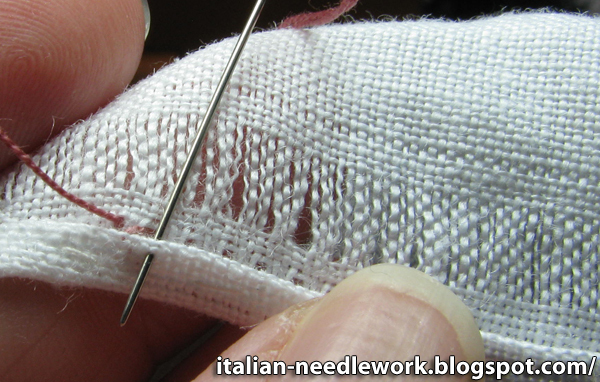 When I first discovered the Italian needlework arena, what I noticed most was how little was known about it to the English-speaking world and how many treasures were just waiting to be brought to light. 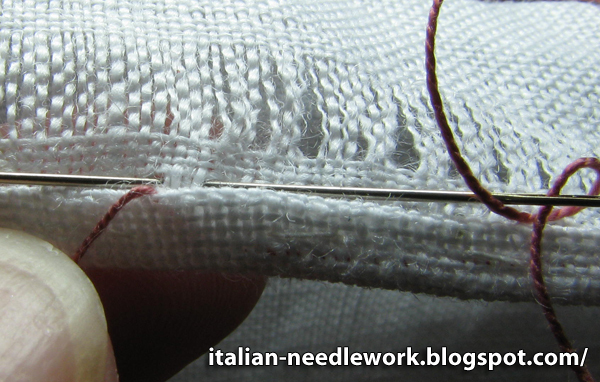 The more needleworkers and textile enthusiasts I met, the more I wanted to show them the wonders of the Italian needlework and textile world. After 10 years of collecting and exploring and researching, I felt it was time to share what I had discovered as I don't feel that all the information that I have collected should be closeted away for my own enjoyment. I am still learning so much that I think I will never run out of things to blog about! What would you change in your blog? If I could change anything it would be the amount of time I have to blog. I wish there were more hours in the day and I could post more often! There are so many others but I must stop at five. Thank you dear readers for a very pleasurable year of blogging, I hope to deliver more interesting things to you in the year to come! 2011 marks Italy's 150th birthday and the country is celebrating for 9 months! If you are planning a trip to Italy this year, don't forget to check for celebrations wherever you are going. Discover Italy in Turin has a lot to look at and plan for on their website (click on the British flag for the English pages). Cover art for the book Le Donne del Risorgimento by Bruna Bertolo. 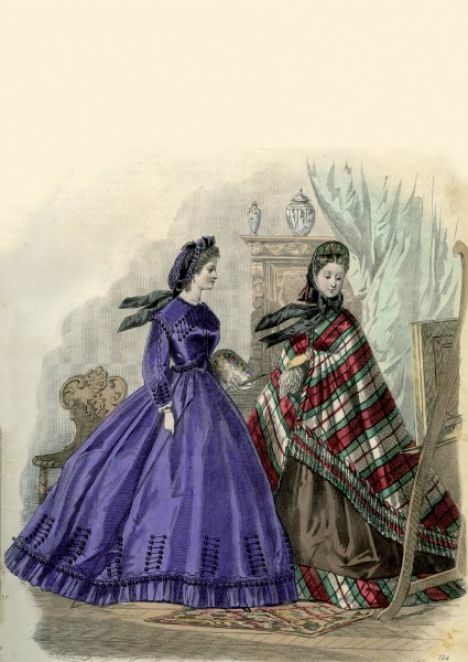 Among the things that are textile-related is the Fashion in Italy 150 years of Elegance exhibit which goes from July 23 to December 11, 2011 at the Venaria Reale about 10 km outside of the center of Turin. 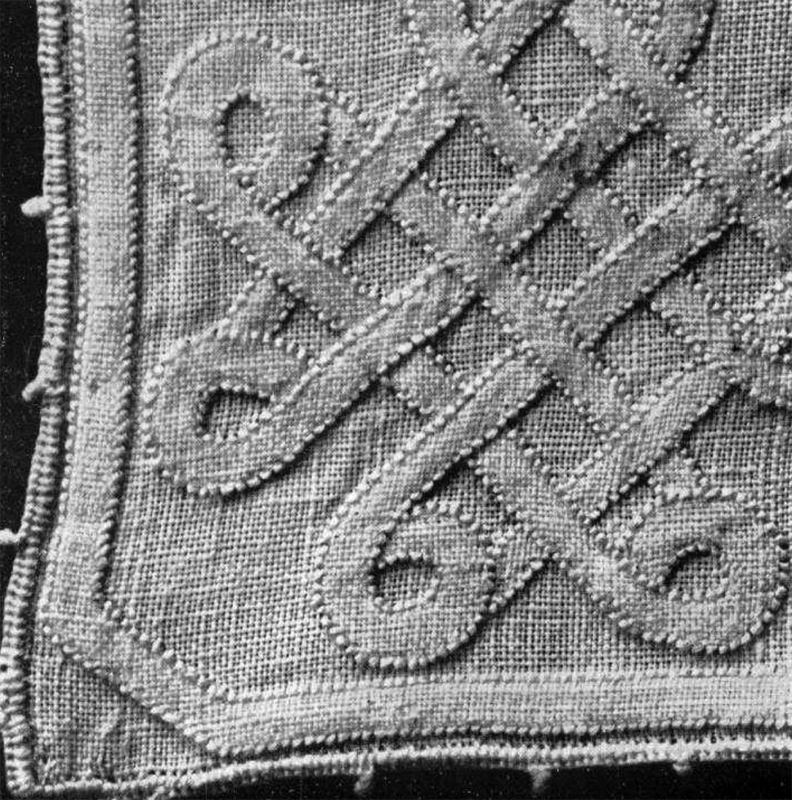 There are several exhibits of Bandera Embroidery in Chieri. Artisan exhibits with an "Arts and Crafts Supermarket" featuring textiles and other hand-crafted articles in Turin from March 17 to November 20, 2011. In Como at the Silk Museum there is a lace exhibit from March 16 to April 29, 2011. There are historical and cultural events in many cities and towns. Don't miss the opportunity to see period costumes and take advantage of reduced rates at many newly restored museums, palazzos and monuments. There will be shows, plays, films, books, historical documents - more than I can list. Please let me know of any textile events you attend, I'd love to see photos! 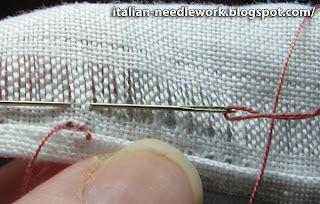 Lots of readers have asked if there is another way to attach a hem while doing the Gigliuccio or Peahole Hemstitch at the same time as executing the hemstitching instead of in a separate operation. The answer is yes! 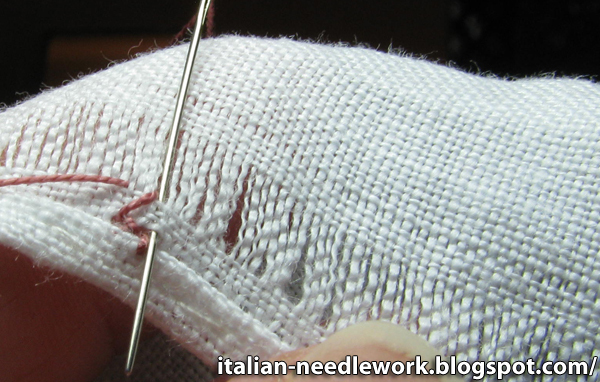 However, the rules of how to execute the Gigliuccio change and instead of executing the work on the frontside of your fabric, you will have to do everything on the back side. So, withdraw your threads for the Gigliuccio hemstitch, turn up your hem and baste it down (to the backside of the fabric). 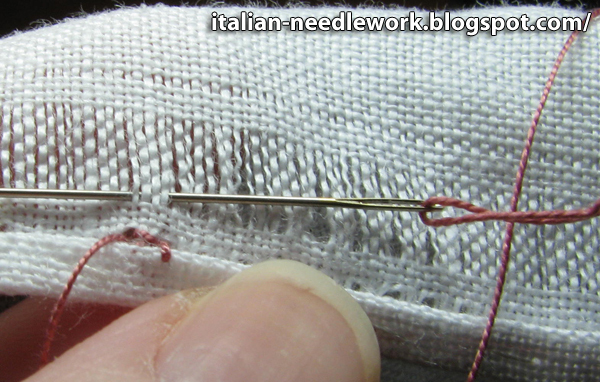 I tied a knot in my thread and then went into my hem area about 2 inches away from where I wanted to start stitching. 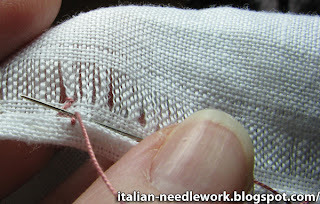 Come up at the top of the hem fold right where you want to begin. Just to be clear, you are coming up from inside the hem fabric, you are not catching any of the front fabric at all. 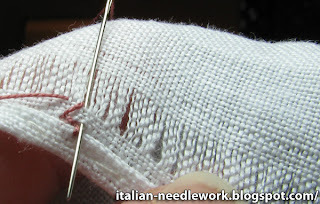 This is the first step of the Gigliuccio hemstitch which is, in this case, the Four-Sided Stitch and the Simple Hemstitch combined. 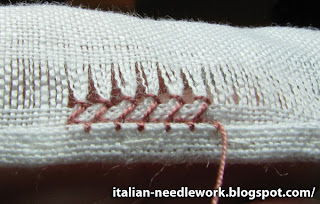 You will have to do the second part of the Gigliuccio (the other row of Four-Sided Stitch and the bundle knotting) on the back side as well in order to have your stitching match. 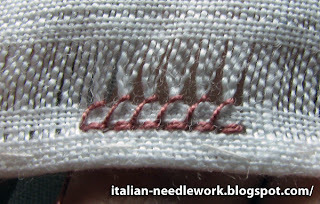 Click here for the second part of this tutorial. 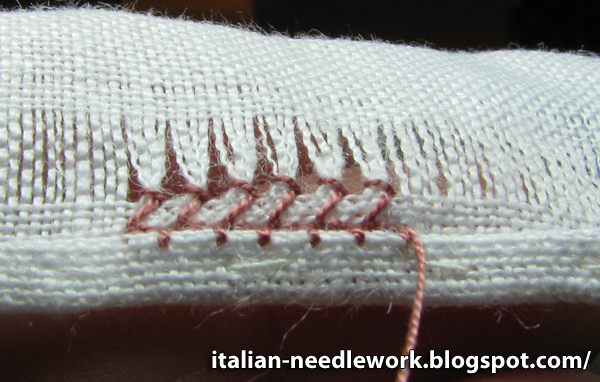 An excellent publication on the finer points of the Gigliuccio Hemstitch is Liliana Babbi Cappelletti's booklet which is available in Italian from Tombolo Disegni. 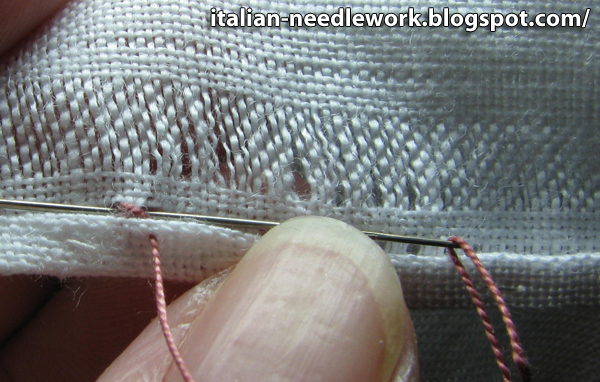 There was an English version done (called Peahole Hemstitch), you may want to contact the author to see if you can get a copy from her. The step-by-step images are fantastic and even if you can't get your hands on the English version, you should have very little trouble with the Italian version. 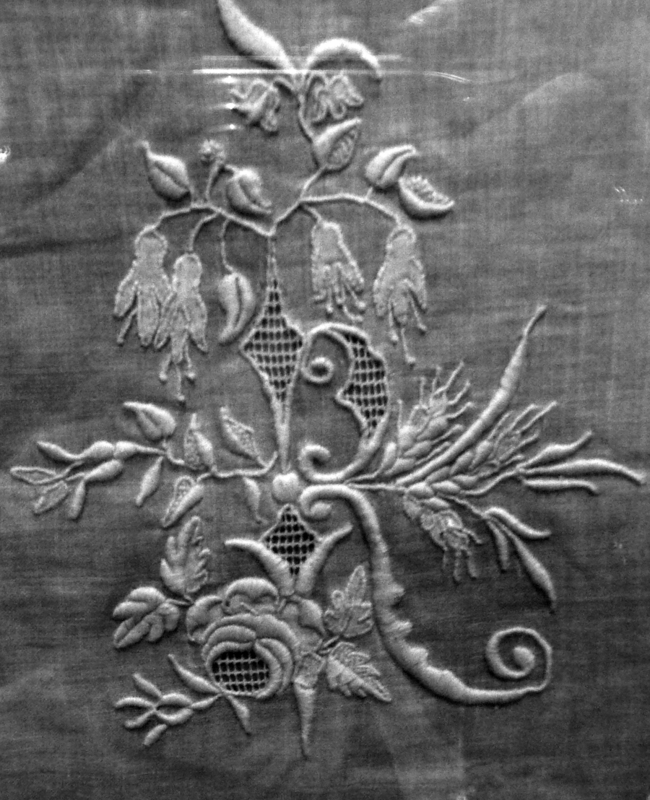 While Shadow Work Embroidery is thought to have originated long ago in India, it is well known in Italy. 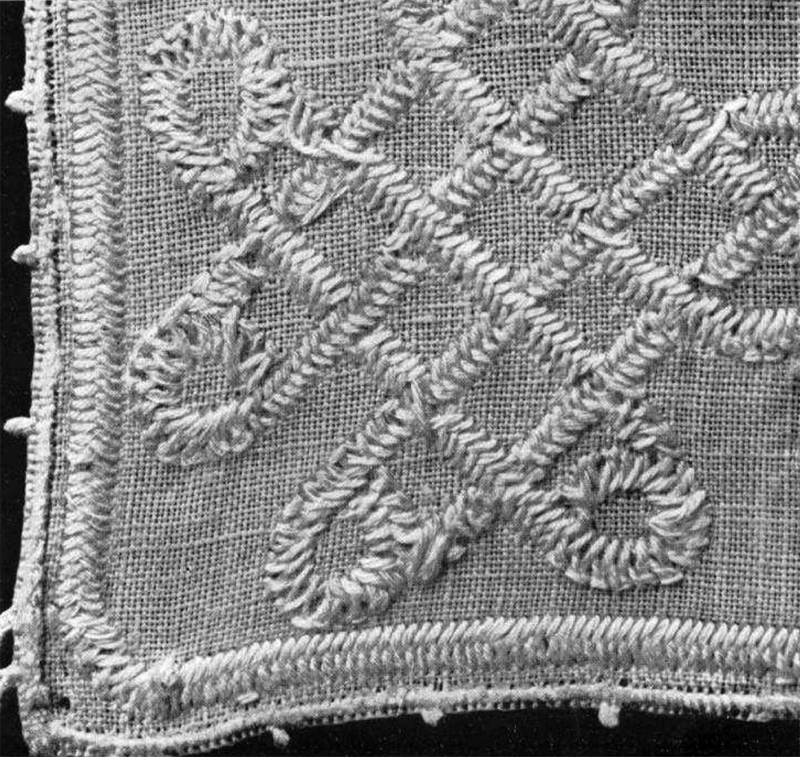 There are lots of pieces to be appreciated in museum collections, look for it on handkerchiefs and table linens especially. The following three photos are of works at the Poldi Pezzoli Museum in Milan. Here Shadow Work is used in the swirly designs which surround other techniques. 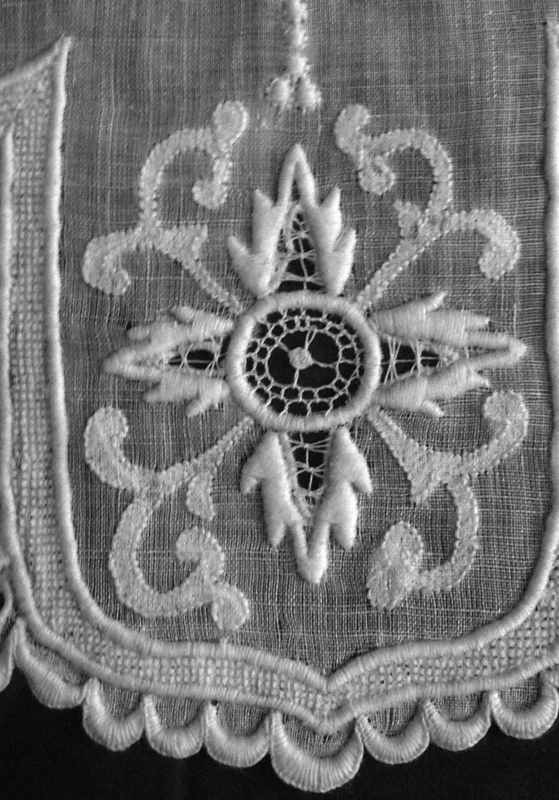 Made with the Herringbone Stitch (worked very close together) or the Double Back Stitch it can be worked on either the back or the front of the fabric and Italy's fantastic gauzy linen fabrics lend themselves nicely to the transparency which is an immediately recognizable characteristic of this technique. Shadow Work is used here in the filling of the letter A. In coloured or white threads, it is usually combined with other traditional needlework techniques like padded satin stitch, pulled thread filling stitches and many others. 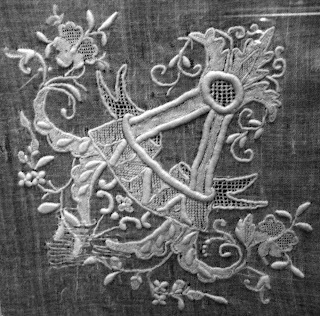 Shadow Work fills the hanging flowers in this monogram. 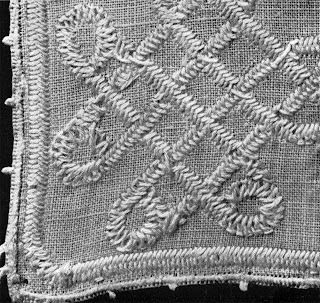 Another recognizable characteristic is the bas-relief effect which can be rendered more dramatic with heavier threads and fabric. These images are from Punto Ombra by Carolina Maraini, N. Zanichelli, Bologna, 1924. Front side of the work using heavier fabric and thread. Back side of the work using heavier fabric and thread. 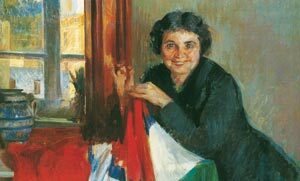 In the first years of the 20th century Carolina Maraini started a women's committee in Rieti (a couple of hours north-east of Rome) to promote local techniques and Punto Ombra or Shadow Work was the basis of the work. 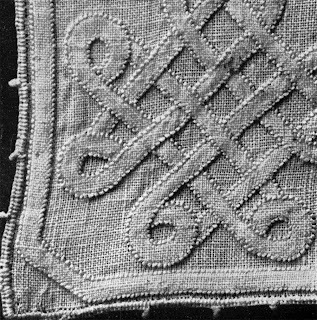 The designs and execution of the work coming from this group were widely known to be of very high quality giving a re-birth to this technique using floral and Vinci knot motifs. Signora Maraini used ivory carvings, wrought ironworks, designs from paintings, marble carvings, fabric designs, print designs and even floor patterns as inspiration for her works. More can be learned about Carolina Maraini and her Shadow Work at the Tuttoricamo website. Click on the British Flag for the English pages, then "Techniques", then "Shadow Work". Make sure to click on the link to see a gorgeous coloured Shadow Work tea service tablecloth! Thanks to Stefania for the use of her photos!